As I flipped my calendar to July, I saw the picture. It is a graceful albatross, flying above the coastline of the Falkland Islands. On July 1, 2017, the NHL began their new calendar season and, as always, a flurry of activity came with it. A bad deal is often called an albatross, and more of these NHL albatross deals happen on the first day or two of July than any other time of the year. For the San Jose Sharks, many important things happened in the first 48 hours of July, involving four major players, including the franchise’s two most legendary players. Joe Thornton checked the “stay” box. He was a free agent for the first time in his career and well, I guess he didn’t much care for it. Within hours, he committed to returning to San Jose, agreeing to a one-year deal. 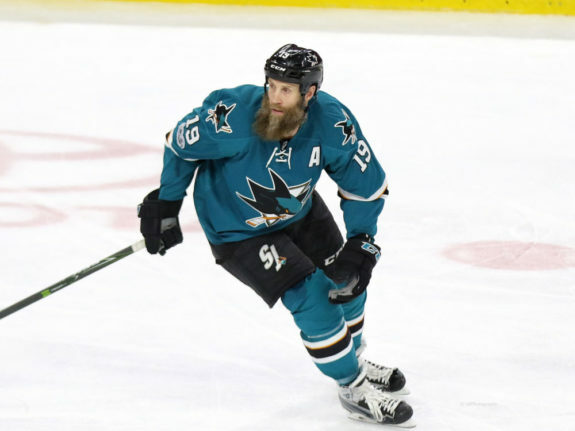 It was widely reported Thornton wanted a three-year deal. For a 38-year-old, coming off a modest season followed by surgery for two torn knee ligaments, the price was insanely high, reported at $8.0 million. At least the term was right. It seems each side gave something to get something. The salary is not overly material (Sharks owner Hasso Plattner has the money), but the salary cap hit is. The salary cap takes the total amount of the deal, divides by the number of years in the deal and allocates it into equal buckets. 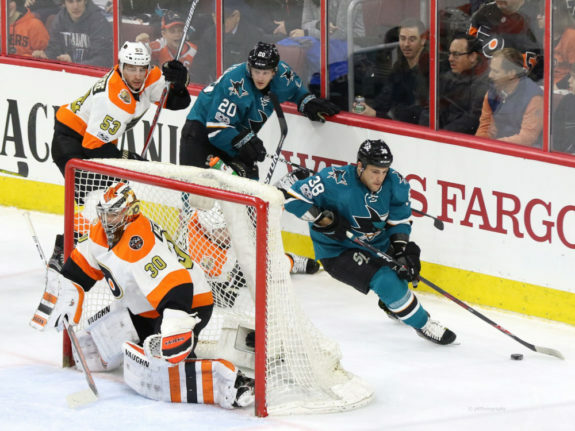 The Sharks have room in their buckets for the upcoming season and the 2019-2020 season, but things look tighter in 2018-19. It’s likely Sharks general manager Doug Wilson and Thornton agreed on three years. The first year is inked, while the next two years are verbal agreements with an owner-backed handshake. In essence, Wilson asked for Thornton to contour deals to the team’s salary cap needs and Thornton obliged. A second deal can be signed as early as January for the 2018-19 season. No doubt, the 12-year relationship between the parties helped get this deal done. This is best for Thornton, even if a three-year deal seems more attractive. A shorter deal makes it easier for Thornton to explore other options. He has spoken about one in particular, playing in Switzerland, where his wife is from and where her family resides. This deal simplifies Thornton’s future options. Patrick Marleau checked the “leave” box, taking a deal to play in a different shade of blue. 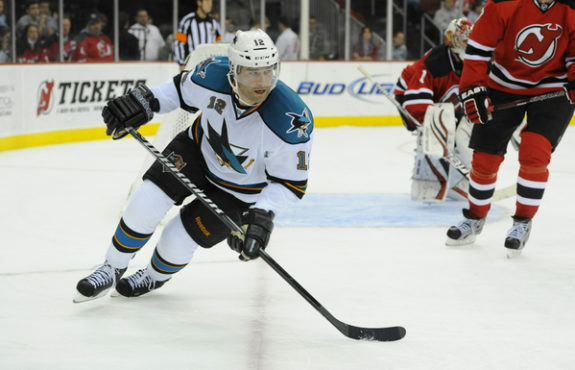 The Toronto Maple Leafs signed Marleau to a three-year deal which the Sharks would have been foolish to match. The Sharks’ all-time leading scorer’s play has been uneven in the last few seasons, though his most recent campaign was quite good. Nonetheless, the Maple Leafs are paying Marleau, who was just outside the top 100 in points by a forward in 2016-17, an average salary which will place him among the top 40 best paid forwards. The fit in Toronto is a good one for Marleau. He’ll play for Mike Babcock, who coached Marleau on Canada’s Olympic teams. Further, Marleau enters a team with great young stars. He won’t have to carry the load of a top line player, but his veteran presence coupled with extensive playoff experience can help the quickly rising team. There will be plenty of discussion about Marleau’s departure. He has been a San Jose Shark for over half his life and is high on a number of NHL all-time lists which have “for one franchise” as part of the description. Though rumors of his departure in recent seasons were rampant and it’s emotional and jarring to see Marleau leaving San Jose. The Sharks may have some interest in unrestricted free agents (UFA), but I’d suggest their better choices are likely to come from restricted free agents (RFA) or trades. Marleau’s departure and Thornton’s one year deal keep this box open. San Jose can place an offer sheet for a top RFA, as they have enough cap space to accomplish this. Among the top RFAs are Ryan Johansen of Nashville, David Pastrnak of Boston and Leon Draisaitl of Edmonton. Offer sheets rarely land a player. Should this tactic do the unusual and succeed, however, San Jose would forfeit up to four first-round draft picks. The reason the 2018-19 salary cap looks more challenging for San Jose is because only two mid-tier contracts expire while two key players get massive raises. The massive raises were signed on July 1. Back in April, I wrote about the two cornerstone contracts for San Jose. As soon as these deals were eligible to get done, they got done. 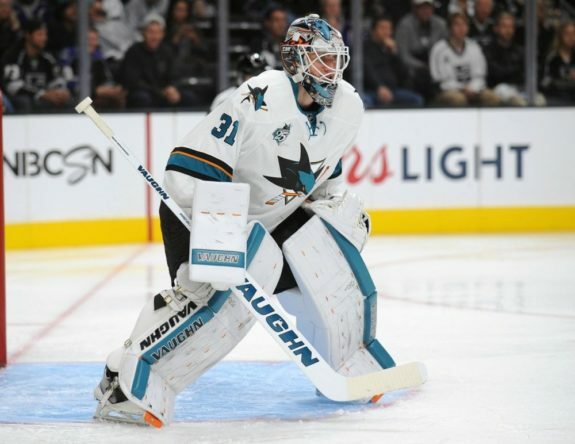 Goalie Martin Jones and defenseman Marc-Edouard Vlasic both signed lengthy deals that do not begin this season, but kick in for the 2018-19 campaign. Their combined salary cap increase is $5.5 million. Vlasic, who for years had been a huge bargain, signed an eight-year deal averaging $7 million per season. It is expensive, and the back end of the deal won’t be pretty (Vlasic will be 39 when it ends), but it does lock down the best lock-down defenseman in hockey. There is little doubt Vlasic would have commanded $7 million in the open market, though I’m doubtful he’d have gotten an eight-year term at that rate. Similar criticisms have been made of the Brent Burns deal (eight seasons at $8 million per year, ending when Burns is 40). Both players will collect big paychecks during their prime seasons, but also during their declining seasons. It is likely at least one contract (and quite possibly both) will be an albatross down the road. Martin Jones is an interesting case. He has been pretty average during his two regular seasons for San Jose. But he has lifted his game in the playoffs. This contrasts with the Sharks’ history of strong regular season goalie performances, followed by ‘not good enough’ playoff performances. Teams pay a premium for the goalie who gets you to the playoffs, then starts stealing games and even an occasional series. Jones hasn’t stolen a playoff series yet, but he has stolen playoff games. His deal carries a $5.75 million annual salary cap hit. This places him eleventh among goalies with contracts covering the 2018-19 season, which is when Jones’s deal kicks in. Goalies are often roller coasters, good one season, bad the next, then good again. There is a risk here, but considering the deal covers Jones’ prime NHL seasons, it’s a reasonable risk. I estimated the Jones and Vlasic deals would take up $12-13million of cap space. At $12.75 million, it falls within that range, albeit towards the upper end. My sense is Vlasic’s eight-year term should have pushed this towards the lower end of the range. These deals help San Jose in another way. It shows that the Sharks are willing to pay well for players who earn it. San Jose has a history of veterans staying put deep into their careers, a positive message for other players considering signing with the Sharks (take note, John Tavares). A bit of a surprise was pugilist Micheal Haley moving on to Florida. 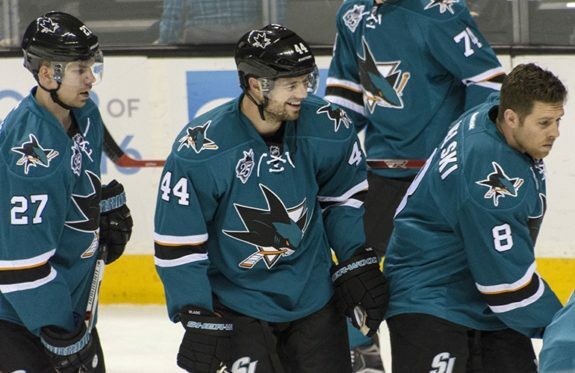 Haley had by far his best season last year in San Jose and proved popular in the locker room. It won’t be hard to replace Haley’s production, but the Sharks seem to like having someone around who patrols the ice and is willing to drop gloves. It’s also nice when these players are not major liabilities. Haley was not a major liability last season. I expect the Sharks to add a Haley replacement at some point. Restricted free agents Chris Tierney, Marcus Sorensen and Barclay Goodrow have qualifying offers, but none have concluded a deal yet. Each can make the Sharks roster next season, but none are a lock. For the Sharks, several key boxes have been checked, but others remain unchecked. Most are towards the bottom portion of the roster, but one major box is at the top. This is a team with playoff-level talent, but they are missing a critical piece if they are to go far. They need a top-tier forward and now have the cap space to fit this player on their roster. The last two days have been emotional and important to the Sharks’ near and long-term future. They haven’t added anyone, but two players left. One of the departed is a footnote in team history, the other practically defines team history. At this moment, though, there is little time for nostalgia. The Sharks have work to do.